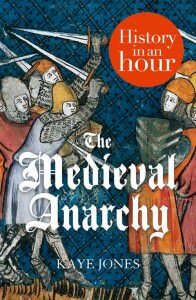 The latest ebook from History In An Hour, The Medieval Anarchy aims to give the reader a relatively quick look at events during the reign of King Stephen (1135-1154), a period of civil war throughout the Anglo-Norman empire. Kaye Jones has already penned a couple of these ebooks, and is reliable in giving a good factual account of the events. Beginning with the sinking of the White Ship in 1120, Jones explains the succession crisis after the death of Henry I, and how Stephen of Blois was able to get the crown away Henry’s daughter Matilda. Stephen’s reign, which was known as The Anarchy, saw much conflict as Matilda and her supporters attempted to restore her to the English throne. The ebook details several of the battles and sieges that occurred, and notes how the various political players in England and France were switching sides and seeking power. Jones offers the readers a strong straightforward account of what happened, the players involved, and the ramifications of the conflict. Being a book that is meant to be read within an hour, many things are excluded: Stephen’s personality and leadership style, why historians have typically criticized his reign, and the hardship caused by the warfare of this period. While I understand that this book is meant as a brief overview, I would have liked to see these topics discussed or at the very least, touched upon. – but those who want to understand what The Anarchy was all about will get a solid start from this ebook.